Thick & Chewy Peanut Butter Chocolate Chip Cookies have been on my mind for about 2 weeks now. I have no idea why, I can’t remember seeing any spectacularly mind-blowing thick and chewy peanut butter chocolate chips cookies in a store or bakery, or even remember talking to anyone about them. Who knows, I might have looked into my pantry, saw PB and chocolate chips and had the thought burning in the back of my brain since then. For some reason I needed to make a crazily decadent, thick & chewy peanut butter chocolate chip cookie and it had to be LARGE. What I do know is that I have discovered a couple of tricks to bakery-style cookies. Or maybe not. This may not be the way that bakeries get those huge yet flat cookies that are all the same shape and thickness, all the way around. However this is the way that *I* will now get those perfect cookies at home without using shortening ( the usual trick for commercial bakeries) or huge ovens that bake perfectly. I mean, let’s look at these Thick & Chewy Peanut Butter Chocolate Chip Cookies for a second. So here’s what I discovered after two batches. Don’t flatten them AT ALL before baking. Even if they stay a dome shape – which they will on non-humid days – don’t worry. The trick to not having the edges brown too much like the ones on the left is to start them out in the ice cream scoop size. 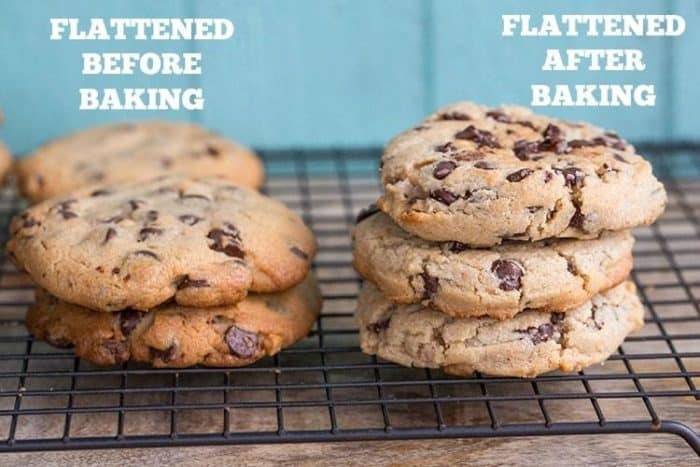 If they are still a dome shape you simply take a spatula or a flat flipper/turner and slowly press down on the freshly baked cookie, right when they come out of the oven. That’s how you get those beautiful crinkled little edges that the cookie on the right has. If you are baking on a humid day, odds are that your dough will be stickier than usual. Try adding another 2- 3 tablespoons of flour to make it less sticky but odds are they are still going to bake up thick and chewy if you still adhere to the DO NOT FLATTEN BEFORE BAKING RULE. Oh, did I say ice cream scoop a few seconds ago? Yes, I did. 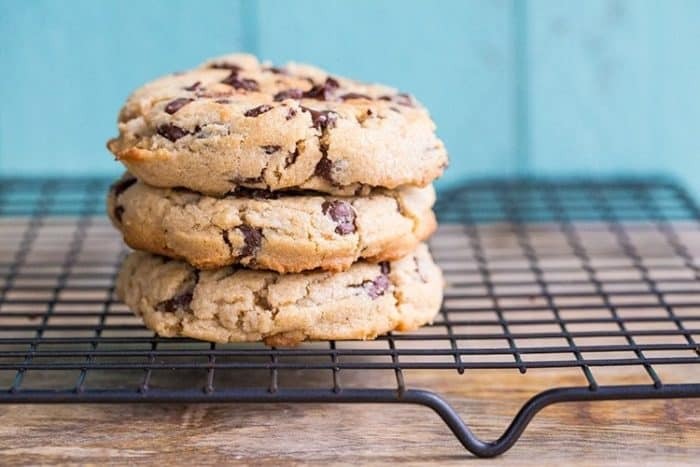 And ice cream scoop is the perfect size to make these large and in charge cookies. Yes, you only end up with 12-16 cookies from this recipe, but they are huge cookies. Also: If all else fails, cut the butter. 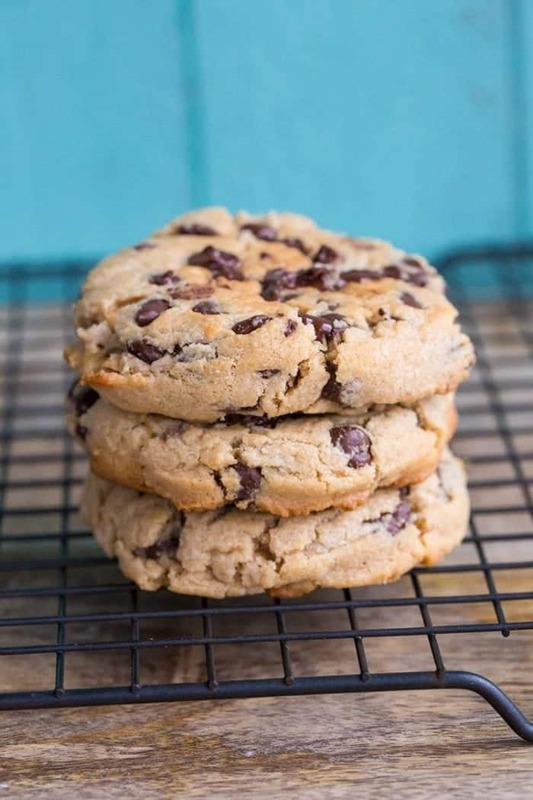 Less butter has always meant thicker, chewier cookies and is the secret to my popular Thick & Chewy Chocolate Chip Cookies. If these aren’t as thick as you want, cut the butter down to 1/3 cup of a cup. Cookies are a persnickety lot. If you live somewhere humid, they’ll spread out and flatten like a pancake. Yesterday, these turned out perfectly and I had to use a flipper to flatten them into the thick, chewy, delicious delights below. They were PERFECT DOMES that didn’t even shift from their original shape. Today I used the same recipe to make sure that they are still great and they flattened out all on their own because it’s snowing here in Edmonton. I could have added that 2-3 tablespoons of flour, but to be honest they turned out just as great as the ones below. Now, I know that YOU know this, but the secret to the best cookies is to under bake them slightly. These just need to be browned all lovely on the outside and under baked on the inside. Fifteen minutes were perfect for mine, but watch yours and see. If you over bake them, they will still be delicious, but not chewy! So in order to get these cookies that thick, you are going to have to work a little. Try one out on your cookie sheet and if it flattens, add some more flour to the dough. Odds are that we are going to have more humid days than not, now that winter is here. If flour doesn’t work, cut that butter down to 1/3 of a cup in your next batch. 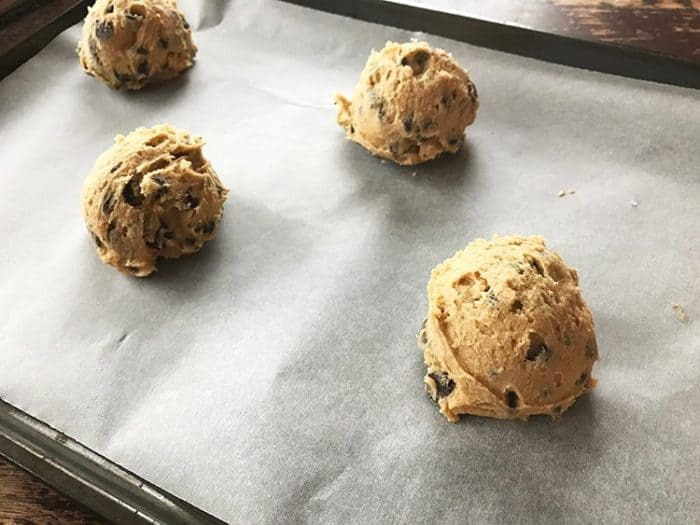 You might have to eat a few batches before you get the feel for what your dough should be like ( it’s not a super-sticky dough, by the way) and I know that taste testing thick and chewy peanut butter chocolate chip cookies is going to be a hard job. How to make decadent Thick & Chewy Peanut Butter Chocolate Chip Cookies with my method that makes perfect cookies every time! Mix in the chocolate chips by hand until evenly distributed throughout the dough. Place by rounded cookie scoop onto parchment lined baking sheets. Store in a container for 3-5 days, but I doubt they will last that long. I am not a baker. I love to cook but not bake. I was asked to make some peanut butter – chocolate chip cookies and begrudgingly agreed. I am not a fan of peanut butter cookies although i do like peanut butter. I do like chocolate chip cookies. I followed the recipe to a tee and the only challenge I had was mixing 2 cups of chocolate chips with the batter as it seemed like way to much. As one other poster mentioned they cut the chips down to 1 cup. I did that as well. I actually had already poured them into the batter mixture so ended up picking them out. Not a big deal. The cookies turned out as described! And I ended up eating a few of the myself as they were very good. Made the recipe and added a tablespoon of flour as suggested to compensate for humidity and they were perfect! Love this recipe!! I love this recipe. I am picky with cookies and don’t like just plain chocolate chip cookies. I’ve made it a few times with my own modifications. Once I subbed Reese’s spread for the peanut butter for a chocolatey- peanut -buttery cookie. My fav variation though has been using a mix of Reese peanut butter chips, Reese’s pieces ( mini baking kind) and milk chocolate chips. I also like to add a bit more salt than the recipe says. I double and even triple this recipe because these cookies are gone fast! 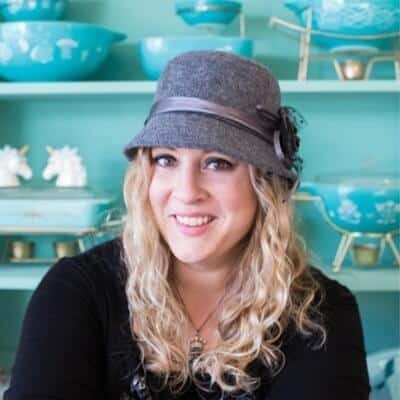 So glad I came across your blog and was even happier that you are from Edmonton, as I am! Hello fellow Edmontonian!! SO glad that you love the cookies, we make them ALL the time! These cookies are addictive. The smash after you bake technique makes a huge difference. Love, love, love these!!! 2. Used 1/4 tsp baking powder and 1/4 tsp baking soda, gives a better shape and doesn’t get too thin. 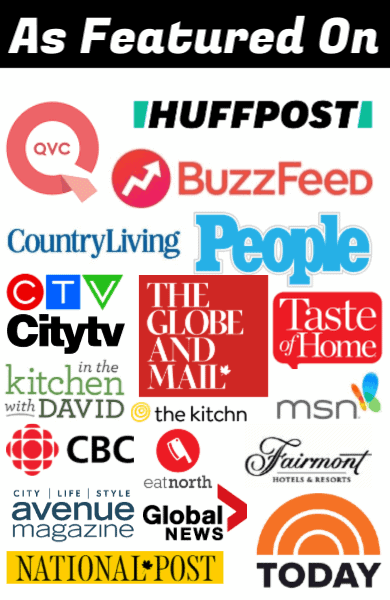 I have sooo many recipes and recipe books because I enjoy baking and always look for new things to make. I made the Thick and Chewy Peanut Butter cookies for my family and they raved about them! The suggestion was made that I could make these again and soon. They turned out exactly as pictured. Thanks for a wonderful recipe. I recently found this recipe and I’m having major surgery in a week. Is this batter freezer friendly? I’d love to have some on hand just for those times we only want one or two. I’ve literally never left a comment or review on a recipe before, but it would be unjust of me not to on this one, considering how much I use this recipe. My friends are convinced I am the Cookie Queen, are genuinely excited when I have a batch ready and are always asking if they can have another. This is coming from mid-20’s adults. I love it. Thanks for the perfect cookie recipe! There are some in the oven now, actually. I make them so often I’m surprised I still need to look at the recipe, to be honest. Aww that’s awesome thank you for letting me know!!!!! I am so glad that you ( and your friends) love them! Turned out perfectly! Love the parchment paper idea, it makes clean up so much easier. No issues with mine, I cooked for 13 mins in a convection oven at 375. These cookies are so amazing!!! My only issue is that when I make a batch i have to beg my family to eat actual meals instead of just cookies. Can I scoop these into balls and freeze them, so that I can bake one at a time? Otherwise I will have to find a way to add some spinach or carrots so no one gets scurvy! ? Omg hahahah scurvy!!! That’s hilarious!! And yes, my Dad pre-makes all my cookie recipes into balls and then freezes them for when my kids come over! They are always fantastic! So glad you like them! 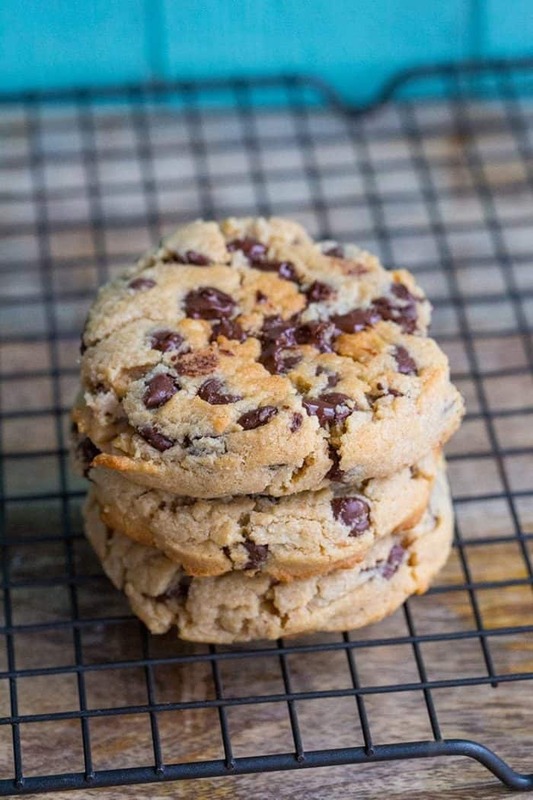 These are literally the best peanut butter chocolate chip cookies out there! I bake them on virtually a weekly basis for our house, friends and family!! Excellent cookies and thorough directions. We love peanut butter at our house, so I use 3/4 cup of peanut butter and only 1 cup of flour. I use a 1/4 cup measure as I don’t have an ice cream scoop. I bake them at 350 in my convection oven for 14 minutes. They bake up perfectly every time. That’s exactly what I did Sana! I cut cc’s by half at least otherwise too much. These cookies are so easy and satisfying. I prefer dark brown sugar & bittersweet c.chips. A very delicious & fun source of protein that I’m happy to give my children and myself? i made it the way it is and perfect thank you for sharing. A lady who loves baking from Asia here. Great cookie, but no matter the oven tweaking the bottoms get VERY dark, some in my first batch burned. I suspect it’s because of the brown sugar. Still a fave, just sent my daughter back to college with a fresh batch to share with her suite mates. I thought your recipe looks just perfect and last night I tried it. Even though I followed the recipe literally, my cookies turned out flat, thin, greasy and draining fat. The chocolate melted (I used chocolate chunks instead of chips). ¿Could you please give me some advise? I’ve been wanting to get some chewy and thick cookies since long ago… ¿Could this results it be because of using natural pb instead of a commercial one? There is so little butter in this recipe that it’s not actually possible for them to be draining fat, it’s 1/2 cup LESS than normal peanut butter cookies ( those use 1 cup of butter). I suspect that you measured wrong somewhere! I use natural peanut butter all the time and it doesn’t do that to the cookies. WOWZA! This is THE COOKIE RECIPE I HAVE BEEN LOOKING FOR! Thank you, thank you, thank you!!! Fabulous! Glad you liked them! Holy moly these are the best cookies I’ve ever made! I looked at so many recipes and these sounded the best… And they sure were! Easy to make too! Thanks for this recipe. The only problem is these are dangerous to have around the house, I’m scared to step on the scale after eating so many of these the past couple days lol. I think I’ll make these next time I go to a party or something! Great recipe, we are GF in our house and so I simply substituted an all purpose GF flour with the regular flour, cup for cup. It worked out beautifully! I can’t wait to make these, so far every recipe of yours I have made has turned out great! Awesome to hear! I hope you LOVE these!!! Love thick & chewy cookies (better than thin ones)! Yay!!!!! I’m so glad it worked for you!!! Doesn’t it make great cookies??? One more look before they’re gone! I am quite thrilled by this cookie! Not only is the cookie delish but the squish after baking trick made them so pretty! I am by no stretch a food stylist \U0001f602 but had to share my “perfect” cookie! I will try this squish method with gingersnaps! \U0001f44d\U0001f3fb\U0001f64c Yay!!!!! I’m so glad it worked for you!!! Doesn’t it make great cookies??? I do the squish with all my drop cookies… it just gives them a nicer look… and keeps them evenly cooked if u use a measuring device!! Do you have a snickerdoodle recipe where they are giant thick and chewy with crispy edges? \U0001f60a I am definitely trying the pb/chocolate chip recipe! Ekatewilcox Just like Disneyland ones, it’s my goal!! One day I will nail the recipe! I am making these as soon as I get home!